This red-smudged rune means "Hunter", and has been adopted by those who have taken the Hunter of Hunters oath. These watchmen admonish those who have become addled with blood. Be they men or beasts, anyone who has threatened the pledgers of the "Hunter" oath surely has an issue with blood. Hunter is a Caryll Rune in Bloodborne. Increases stamina recovery speed by 10%. Members of the hunter covenant may be summoned into a blood-addled hunter's world without ringing the sinister bell as an invader. While this rune is equipped, there is a small chance (~30%) that a summoned player will be hostile to you, or you will be hostile against a host who summoned you. It is unknown what conditions must be met to trigger this (if any), but even against players who do meet the conditions for it the effect will only activate about 1 time out of 3. It is assumed that players who frequently invade or kill NPCs are considered "Blood Addled" , though this has yet to be confirmed. When the hostile summon effect triggers, the player who was summoned will spawn with a faintly purple glow instead of a blue one. This can be hard to notice if you aren't looking for it. Hostile summons occupy a summon slot, reducing the total number of other players the host can summon by one, but do not prevent an invader from also showing up. Hostile summons can attack invaders, normal summons, and the host. It is possible for a very unfortunate host to have two hostile summons, in which case the purple summons will be allied with each other and won't be able to attack each other, but can still attack the host and invader. If this happens, the host player will not be able to summon anyone else until one hostile summon is killed to free up the summon slot. Earned by completing the Eileen the Crow questline. Rune Workshop Tool is required in order to memorize this rune. The guidebook's information on the Hunter rune does not hold up under testing, unfortunately. 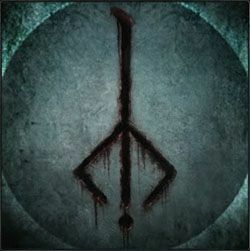 The design of this rune may be a reference to the "Mark of Sacrifice" that is seen in the manga/anime Berserk. Relevant lore theories can be found under Moon Presence Lore and Tarot Cards and Bloodborne. Strange. I almost never take this rune off and have never seen anything to do with hostile summons. Didn&apos;t even know it was a thing. I need to test this again but I went into the nightmare frontier and rang the small resonant bell to help some people. I was summoned ten times and put of those ten times there were four "blood-addled" hunters consecutively. I need to try this again as said before and ask the people who come up blood-addled how many times they invaded. Its probably late to comment about this but I hae 2 theories regarding "blood addled." 1. Its just text that means nothing and is only for lore. 2. What if it just a hunter who has killed during a particular run? After all, you get covered in blood from killing enemies even if you dont get hit, and hunters lore wise dont need to be evil or anything in order to sucumb to the beast plague. So maybe it means a hunter who is showing "bloodlust" of any kind? Like by going on a kill streak. But alot of summons occur when a player is fresh and wants to fight a boss so unless its an underlyingconstant stat or related to time away from the hunters dream its probably not that. I have two characters, one who does a lot of invading, and one who has never so much as touched PvP. When this second character of mine was invaded through the beckoning bell by these hunters, despite certainly not being blood-addled, it lead me to suspect that your "sin" level is tied to your account, not to your individual characters, similar to how it works in Dark Souls 1, leading to these curious situations where your innocent characters can pay for the sins of your others. It&apos;s possible that PvE sin can make you a target for these hunters, as some are suggesting, but I won&apos;t be satisfied with that explanation until it&apos;s proven. The Hunter of Hunters covenant has nothing to do with Executioners or Vilebloods. There is a 5% chance that when summoned as an ally after ringing the Small Resonant Bell, you will instead enter the world of a Blood-Addled Hunter as an adversary. This applies to all attempted co-op sessions. Eileen died during the fight with Hernyk. Can I still get the covenant rune if I picked up her badge? A summon executioner became an adversy against while I had the HoH rune on. Is this new?? There is no delay of stamina regen! I was wondering long time but increases the effectiveness of oath runes when you use them? Killing blood addled hunters (whatever that is) in coop could make it stronger. Anybody confirm or deny, plz. well, i just equipped it and.. my 192 of stamina refills at same speed of before.. always 6 seconds.. what it means? Isn&apos;t this particular sigil similar to the Brand of Sacrifice in Berserk, albeit missing the top [incomplete] diamond? The contrast also being the Interstice in Berserk and the nightmare in Bloodborne. While having the Hunter Rune equipped, I was using the Small Resonant Bell to aid others in fighting Martyr Logarius and I got summoned, but it said the hunter was Blood-Addled and I had to fight the Beckoner instead of assist. I am to understand this is how covenants work in Bloodborne, but what I don&apos;t understand is what makes another player be considered a "Blood-Addled Hunter"? is it just equipping the runes of the other two covenants or did that player I inadvertently invaded already do some PvP and in doing so acquired some kind of invisible "sin" counter? I should try experimenting in an area with High-PvP with my Small Resonant Bell.